You know you’re an illustrator when you see faces on inanimate objects! I was making a sketch of some flowers, and these guys showed up!! This week, as part of Sunday Sketches, Alexandra is having a contest. She asked last week for us to create a new logo for Sunday Sketches. It will be used while she is away in England. and changed them out a bit for something that says British. Hence, the little teapot and cup of tea! I didn’t have time to color it. But I guess if it gets chosen, I will make the time ☺ Wish me luck! What a great idea for the challenge, Sue. You should color it no matter what. so cute, both pieces! Great take on the logo! Hehe... it's gorgeous . I love the pouring teapot into the U. Very clever. I hope you do decide to colour it because I'd love to see your idea completed. Good luck! Enjoy your Sunday and I wish you a wonderful week ahead. Love what you did with the logo! it looks great. I hope you have a great new week!! Oh that logo design is really sweet, I love it! The flowers are lovely too. the flowers with faces are so adorable! 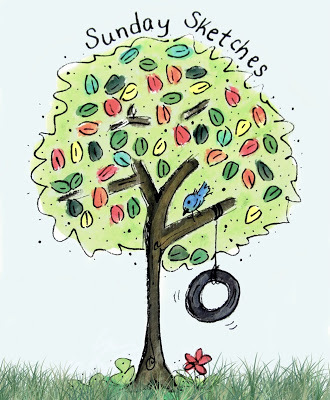 your sunday sketches logo is just as adorable. 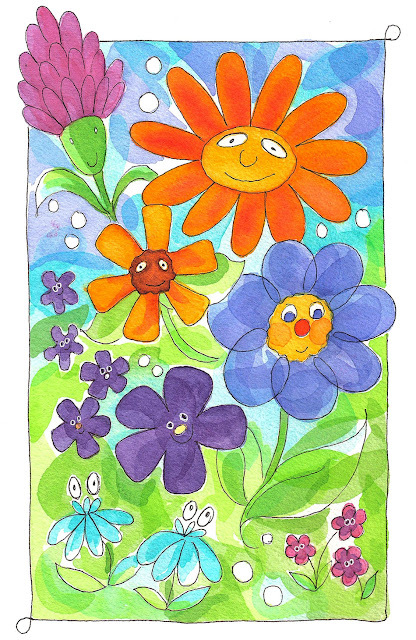 I love the whimsy and bright colors of your flowers. They look like they're singing or floating underwater. The hanging teapot pouring into the cup is very clever. Cute little flowers! And I love the logo!